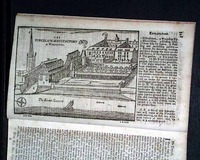 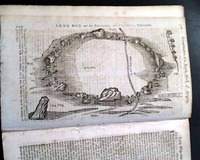 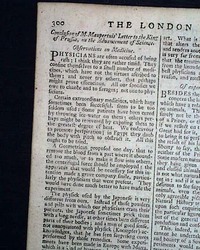 THE DAILY ADVERTISER, London, 1730 See the photo for an example of this title from our archives. 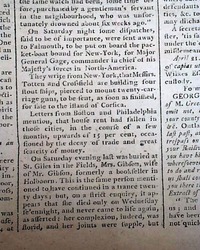 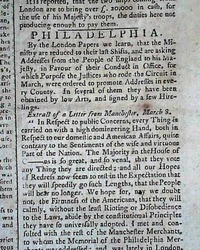 A "typical" newspaper from this period--from before George Washington was born. 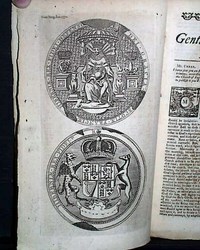 As the title would suggest, there are many advertisements, some quite fascinating. 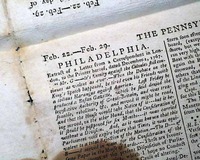 Also a partial red-inked tax stamp. 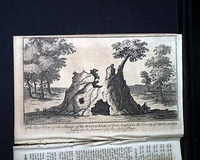 An archival repair at the spine margin. 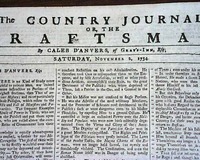 THE COUNTRY JOURNAL, OR THE CRAFTSMAN, London, 1734 A nice "typical" newspaper from England from when George Washington was just two years old. 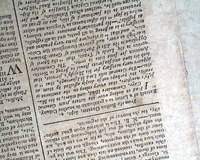 Various news of the day and many ads, a few of which have small illustrations. 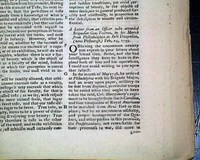 The double year reflects the two calendars in use at the time. 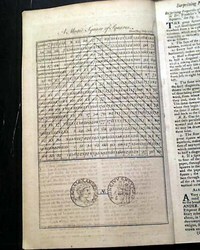 My today's calendar the year is 1736. 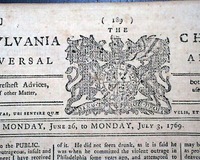 This was the very first successful magazine in America, preceded by just a few magazines which lasted but a couple of issues--one of which was by Ben Franklin. 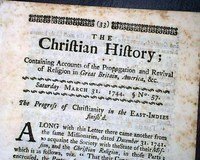 Even this title lasted but a few short years. 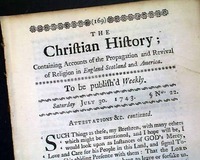 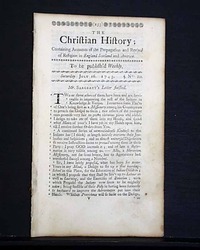 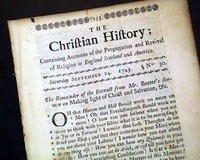 THE CHRISTIAN HISTORY, Boston, Massachusetts, October 22, 1743 This was the very first successful magazine in America, preceded by just a few magazines which lasted but a couple of issues--one of which was by Ben Franklin. 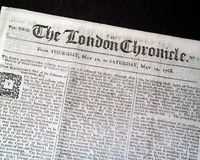 Even this title lasted but a few short years. 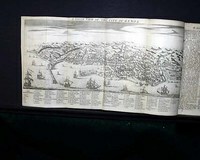 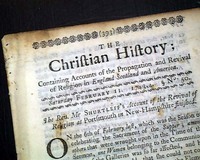 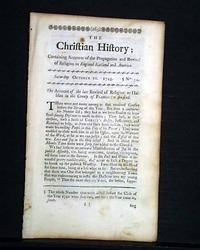 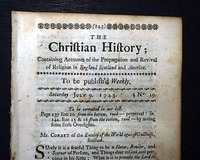 THE CHRISTIAN HISTORY, Boston, February 11, 1743/4 (year double-dated for two calendars in use at the time. 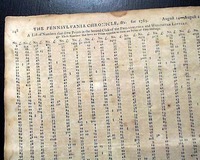 Would be 1744 by current calendar). 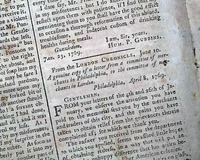 THE GENTLEMAN'S MAGAZINE, London, April, 1747 Inside includes the well-known Ben Franklin item: "Speech of Molly Baker" (see hyperlink) To date, this is the earliest Ben Franklin appearance in a Gentleman's Magazine and perhaps within any British publication, as confirmed by the Franklin Papers, Yale University. 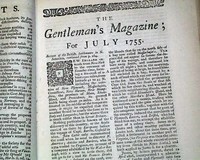 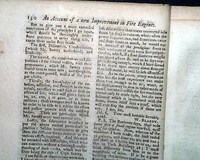 THE GENTLEMAN'S MAGAZINE, London, England, May, 1750 Perhaps the most notable item is: "A Curious Remark on Electricity, from a Gentleman in America, whose ingenious Letters on this Subject will soon be published in a separate Pamphlet...", which includes an extract of a letter by Benjamin Franklin (see hyperlink). 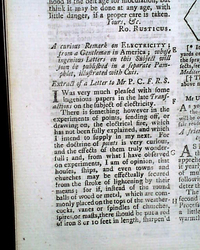 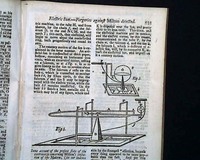 THE GENTLEMAN'S MAGAZINE, London, December, 1750 The most noteworthy feature is the article: "Curious Experiments in Electricity" takes a full page & includes a footnote reading: "In an account of some experiments made in America by Mr. B. Franklin now in the press) we find a yet more surprising hole made thro' a quire of paper.". 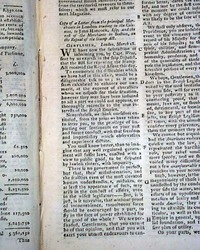 THE GENTLEMAN'S MAGAZINE, London, September, 1766 One of the better items is a letter: "...from the Principal Merchants in London trading to the Colonies, to John Hancock, Esq., and the rest of the Merchants in Boston, on the Repeal of the Stamp Act" which has some great reading. 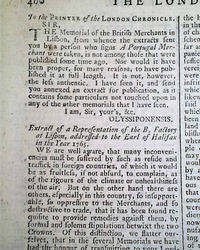 This letter takes a full page (see for most). 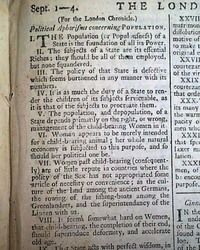 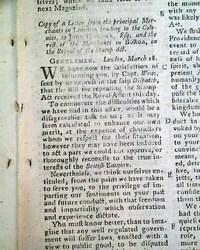 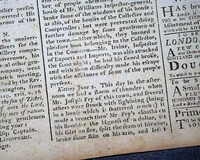 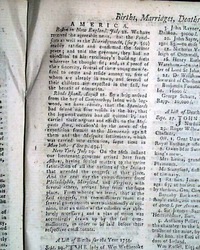 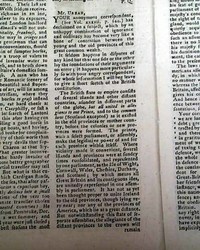 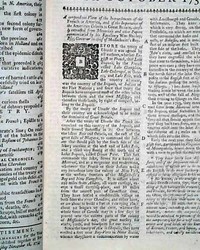 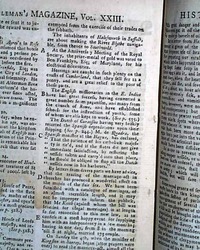 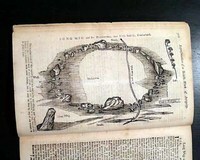 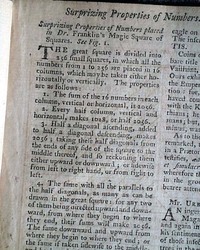 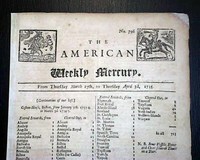 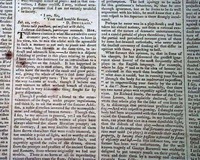 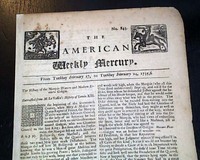 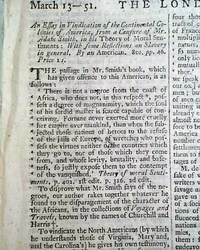 THE GENTLEMAN'S MAGAZINE, London, November, 1766 Most of a column is taken up with: "American News". 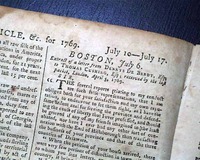 THE BOSTON CHRONICLE, June 20, 1768 The entire front page is taken up with "Sermons to Asses--Said to be written by B. Franklin Esq." 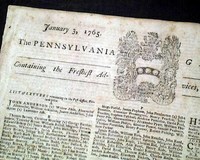 but in fact it was not written by Ben Franklin. 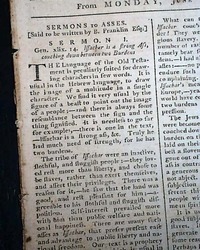 This sermon carries over thru pages 2, 3, and 4. 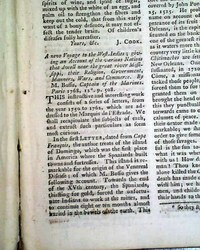 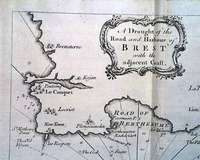 A notable title from the colonial period, that has an ornate royal coat-of-arms engraving in the masthead. 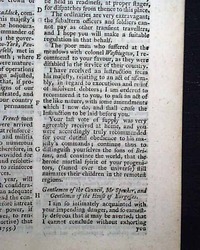 Content includes a lengthy ftpg. 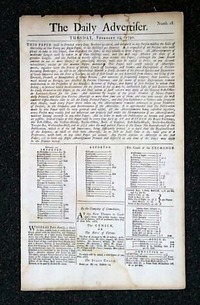 letter addressed "To the Printer" that is signed in type: Atticus.